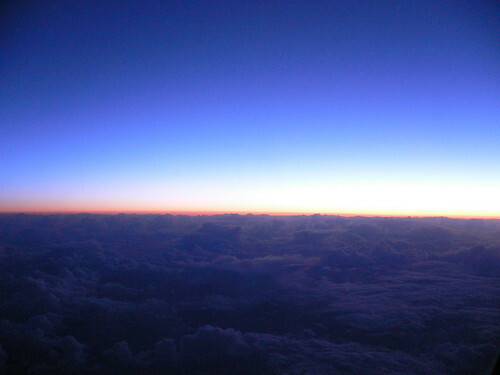 It was 6:37am Pacific Time (12 Apr 2005) and I was bored stiff in the air. Hence, I decided to whip out my new toy, the Lumix, and attempt to do some "photography" which later proved that I shouldn't quit my day-job. By right, the sun would have been up at 6am at 39,000 ft but since I was 3 hours away from Los Angeles then, I would estimate the time to be around 4:30am at the spot where I was taking the pictures from my window. 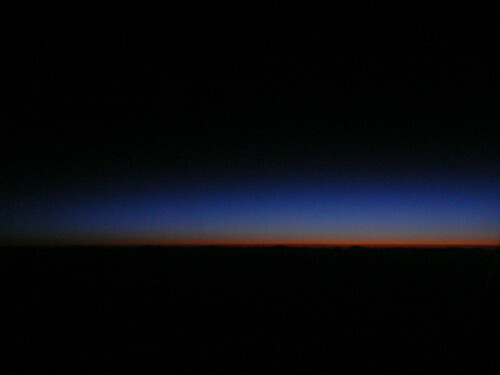 This is pre-dawn where the black portion at the bottom are the clouds that we were above then. Note the faint amber glow and the blue tint above hinting of a new dawn. 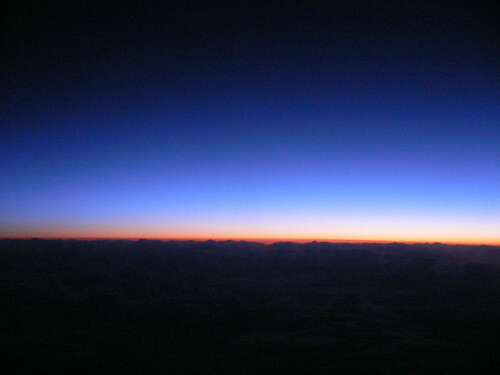 The glow tapered from right to left indicating that right side of the picture is East, where the new rays of sun were coming. 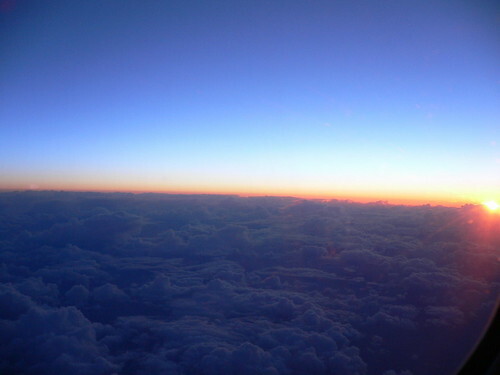 As we were flying into the direction of the sunrise at slightly under 1000 km/h. Watching the sunrise machiam watching it on tape with X2 speed feature switched on. Ahh... finally the clouds below gotten enough illumination to show themselves in their cotton-puff splendor. And finally, ladies and gentlemen, the sun making its majestic entrance from beyond the horizon. it's me back again swimming here. Nice nature. I totally obsessed with the picture. So beautiful. Liked a paradise feel. Haha. thanks for dropping by again. Welcome back. I have another series of "nature" pictures that is closer to ground.